As a behavioral scientist with both teaching and research responsibilities, I am always looking for ways to save time. Yet, so many of the applications touted by those in the computer field could be more quickly accomplished with a pencil and a stack of 3×5 cards. However, Screen Pro from Kansas City Computers, Inc. has saved me time, and, in this article, I will describe some of the features of this program, and how I applied it. My home system consists of a CBM 8032 computer, a CBM 8050 disk drive, and an Epson MX-80 printer. 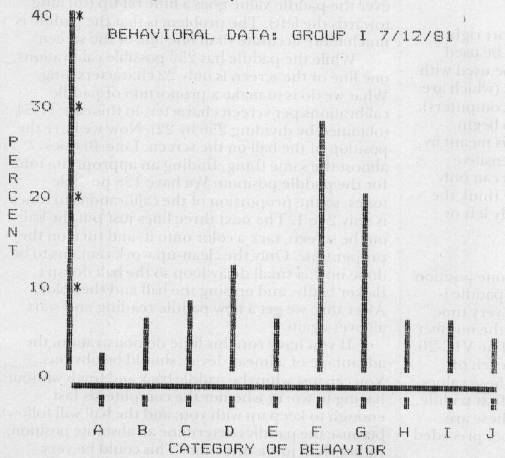 The data from my behavioral experiments (and many others) are expressed in a relative frequency distribution: 10% of the subjects exhibited behavior X, 20% exhibited behavior Y, etc. Typically, these data are represented in tabular form. When you have multiple experimental conditions and, thus, many tables, it is difficult to see trends or changes in the data. So, a bar graph, or histogram (see Figure 1) is often used instead. It is much easier to visually scan a series of histograms and detect changes in the data than with many tables. But how could I convert my frequency data into a histogram quickly and simply and have it printed out on my MX-80? That is where Screen Pro came to the rescue. Screen Pro has some other nice features. When editing a screen file, it uses a temporary scratch space on disk, so you can either save or scrap the screen file you are currently editing, and at the same time keep a backup of the original screen file as it was before you started editing. Also the author of Screen Pro, Keith Peterson, has gone to some trouble to explain how, if you understand BASIC programming, to create your own programs using his machine language subroutine. Being an amateur programmer, I don't fully grasp his instructions, but perhaps you can. He has taken a very refreshing approach by not protecting any of the software, so you can examine it and change it to your specifications. Essentially, if you write your own program, you can create hundreds of screen files with the ability to branch from one file to many others in the series. Mr. Peterson has provided the would-be programmer with several demonstrations of how to do this. In essence, then, you could create a sort of information management program, although it would lack many features of a typical data base management program, such as Create-A-Base, or Commodore's Ozz. There are a couple of things I have not been happy with, however. First, the documentation, while better than some I have seen, is written by the programmer for people who already have some knowledge of programming and computers. My impression of many in the micro industry is that they consider quality documentation unimportant, yet there are people around who are trained to explain computerese in everyday language; usually, however, they are not programmers! The second problem concerns the Epson printer. Screen Pro was designed only for the Commodore 2022 and 4022 printers, and the author states so and shows you the section of the program where you can write a routine for your own printer. Without such a routine, however, when text is placed on the screen the Epson prints upper case characters as Epson graphic characters; lower case characters are printed correctly, but capitalized. This is a serious problem for me, and I guess the only thing to do is to write a routine to handle the case conversion. The Epson also presents a problem for graphics applications, such as mine, because it lacks the Commodore graphics characters. However, I did figure out a simple solution for my histogram application. When one of the Commodore graphics characters is placed on the screen and printed on the Epson, it comes out as one of the Epson block-type graphics characters. So I placed all of the Commodore graphics characters, available from the 8032 keyboard, on the screen and then printed these on the Epson. From the mish-mash that resulted I was able to pick out suitable symbols to create the simple vertical and horizontal lines that are required in constructing a histogram. For example, the letter "J" on the 8032 keyboard produces a vertical bar on the Epson when the 8032 is in the graphics mode. This method produces funny pictures on the 8032 screen, but this has proved to be only a minor annoyance since there is enough resemblance to the final product produced by the Epson. Overall, Screen Pro is a welcome addition to the software collection for the Commodore systems, and at $39.95 is very reasonably priced. It is fast, relatively easy to use, and fills a very specific need that I have had for some time. Now, if someone would just come up with a similar package which would allow the user to produce a graph rapidly, such as a sine wave, on the screen and have the image come out on an X-Y plotter, such as the MIPLOT!